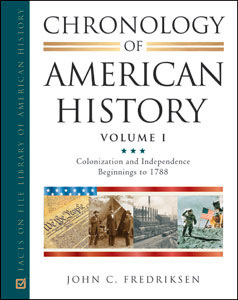 Beginning with the earliest settlements of the Americas more than 12,000 years ago and leading up to recent events in the 21st century, the new four-volume Chronology of American History covers the entire span of American history. Nearly 8,000 chronological and detailed day-by-day entries allow readers to follow events as they unfolded, with each event preceded by a convenient topical marker that makes it easy to locate subjects of interest. More than 400 feature boxes, scattered throughout the text, highlight historical personalities. More than 200 illustrations, photographs, and maps provide useful context and bring the events and people to life. Comprehensive coverage spans a wide range of subject areas, including military/diplomacy, science/technology, literature/culture, economy/business, transportation, religion, society, and sports. This authoritative and accessible reference will be especially valuable for students, researchers, and history buffs. "...will undoubtedly set the standard in the field...extremely comprehensive and interesting...highly recommended for all undergraduate, school, and large public libraries..."
"...an impressive compilation…will be useful to serious history-minded readers. Recommended for public, high-school, and college libraries."